President Donald Trump expressed confidence Tuesday in his administration's ability to handle Hurricane Florence, which is due to make landfall Friday. WASHINGTON — President Donald Trump said Tuesday that his administration is "totally prepared" as Hurricane Florence barrels toward the Carolinas and Virginia. Predicting to reporters that the storm would be "tremendously big and tremendously wet," Trump said the government is "sparing no expense" to ensure Americans' safety. 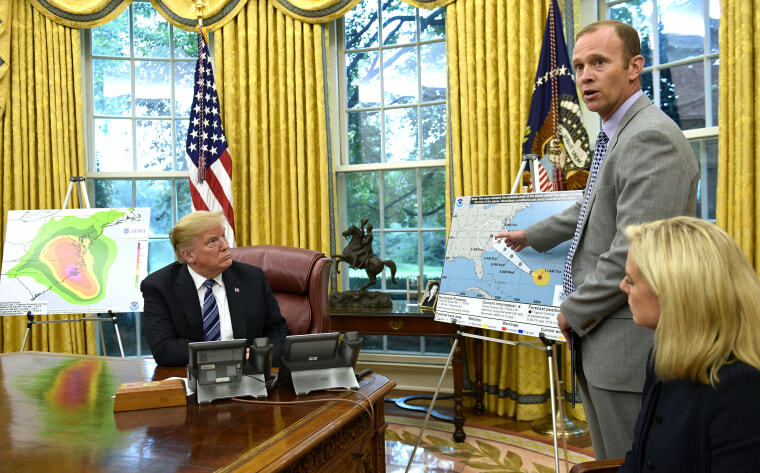 Trump's confident remarks came at the beginning of an Oval Office meeting with Federal Emergency Management Agency Administrator Brock Long and Homeland Security Secretary Kirstjen Nielsen in the Oval Office. As he spoke, the Category 4 hurricane had maximum sustained winds of 130 miles per hour and was expected to make landfall Friday morning, according to the National Hurricane Center. He continued the remarks Wednesday morning, tweeting that, "We got A Pluses for our recent hurricane work in Texas and Florida (and did an unappreciated great job in Puerto Rico, even though an inaccessible island with very poor electricity and a totally incompetent Mayor of San Juan)." "We are ready for the big one that is coming!" Trump wrote. A recent study estimated that nearly 3,000 people died in Puerto Rico in the first five months after that storm hit — a 22 percent increase in deaths compared to previous years. The government of Puerto Rico announced just weeks ago, nearly a year after the hurricane strike, that power had been restored across the island. The mayor of San Juan, Puerto Rico, called Trump’s comments Tuesday about Maria "despicable." "If he thinks the deaths of 3,000 people is a success, he really doesn’t know what this was all about,” Mayor Carmen Yulín Cruz said Tuesday evening on MSNBC's "Hardball with Chris Matthews." She said the crisis is still ongoing, that the infrastructure in the island is still very weak, tens of thousands of homes have blue tarps or blue roofs, and that rates of suicide or attempts have risen dramatically in the aftermath of the storm. "So I really don’t know where the president gets the nerve to call this a success story," she said. "He thinks this is about him, and about his political position." Trump’s comments come exactly one week after the release of a U.S. government audit that found federal disaster responders were overwhelmed by the spate of major hurricanes and wildfires that wreaked havoc across the country in 2017. The report, “2017 Hurricanes and Wildfires: Initial Observations on the Federal Response and Key Recovery Challenges,” found that the Federal Emergency Management Agency was stretched thin amid its response to natural disasters in the continental United States — Hurricanes Harvey and Irma, and the wildfires in California. It also concluded the agency faced “numerous challenges” and “complications” in its response to Hurricane Maria. “Some of FEMA’s disaster staff deployed to Puerto Rico and the U.S. Virgin Islands were not physically able to handle the extreme or austere environment of the territories, which detracted from mission needs,” the report said, adding that agency officials had told auditors that “the physical fitness of staff could be assessed” going forward. The report from the U.S. Government Accountability Office also said some 54 percent of emergency personnel were not qualified to do rescue work in October 2017, a month after the Category 4 storm slammed the U.S. territory. Trump also predicted Tuesday that Congress would find money for disaster recovery in the wake of the hurricane. But that could be a tough sell with some of his most ardent supporters in Congress if there aren't budget cuts to match any new spending. For instance, Office of Management and Budget Director Mick Mulvaney, then a House Republican from South Carolina, tried to force the government to find offsets to pay for tens of billions of dollars in disaster aid after Hurricane Sandy hit New York and New Jersey in 2012, ultimately voting "no" on the Sandy aid package. But Trump expressed no fear that there would be a battle over recovery money. "Congress will be generous because we have no choice," Trump said.